Raising A Bilingual Kid: Quinceañera Talk - Fueled by chile, frijoles & tortillas. The question was really meant as a joke. Are you going to have a quinceañera when you grow up? What really caught me by surprise was his response (as you’ll hear in the video below). In all of his eight years and eight months Edgar really believed it was normal for girls and boys to have a quinceañera: “yeah, I am,” he said and I couldn’t help but crack up! I know very bad demonstration of self-control on my part. Me: You are going to have a quinceañera? Him: No… only girls have quinceañeras! After stopping myself from a full-fledged carcajada, which I thought immediately would be too traumatizing for him to bare, the next words to come out of my mouth, in a much more sensible tone: if you could have one, would you want to? He continued denying any desire to have one even though just seconds earlier he had seemed so eager about getting “his big day.” We laughed it off and in a couple of minutes were both fast asleep. The next morning we got up in a panic, racing to get out of the house in time because my niece was having her own fifteen that day. During the church service I couldn’t help but to think about our earlier conversation. 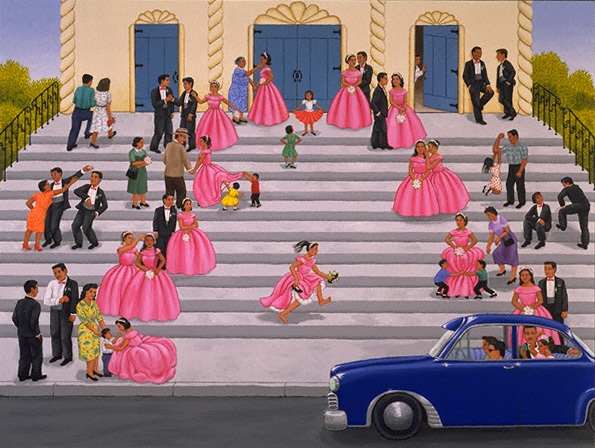 If turning quince for a girl means holding a private mass in her honor and an even bigger pachanga afterwards because the birthday is really a rite of passage, shouldn’t it also be one for a boy? When did I first learn it was not in my future to have a big quince celebration? Was this just another reason for girls and women to be able to claim that they are more mature than us boys and men, or in some cases both? Did I ever ask that question of my parents? I don’t know. I haven’t asked them because I’m afraid the response might be too embarrassing for me to hear, but for as long as I can remember it was just known that my sisters could have a quinceañera… not me, or my brothers. They never actually had one, which I guess should be some consolation, but my mother did make my eldest sister a quinceañera dress herself, which she then wore in our back yard with my cousins and aunts, as we sang her “Happy Birthday” around an also homemade cake. My other sister opted for a store-bought dress in Mexico, even if it wasn’t truly a quinceañera dress, which we also accompanied with cousins and aunts, only this time with a cake made out of mostly JELL-O instead of homemade bread and marmalade. In all honesty, I don’t think I ever truly desired a celebration of my turning fifteen, or any other age for that matter. I’ve never been much of a birthday party person, especially not when it comes to my own, but for all the thinking I was doing, there wasn’t a reason that actually made sense to me as to why we could not celebrate Edgar’s 15th birthday if we wanted to. I’m not saying that we are, but the seed has definitely been planted. And here’s the conversation that started it all! This is the fourth post in the ‘Raising A Bilingual Kid’ series. To read the first three posts in the series, just click on the links (Raising A Bilingual Kid: Ballet Folklórico), (Raising A Bilingual Kid: Skinny Jeans And Converse) and (Raising A Bilingual kid: Pozole, Frijoles and Indian Curry). Ay Juan, Edgar´s voice is soooo sweet! And I love how you two guys are such good pals. Very sweet conversation. He cracked me up when he whispered that we had heard nothing. LOL! BTW – love the image you chose. Carmen Lomas Garza is one of my very favorite artists. About your boys quinceañeros I’m starting to think it would n’t be such a bad idea, las long as he doesn’t want to wear a dress… then I may literally fall over in shock, hahaha! No dresses! LOL … a tux! I think quinceañeros are a great idea! If we had a son, we do it! We discussed it before we even married and hubby said, he’d always wished he could have one, but it was too embarrassing for his familia to have a ceremony for a boy. I think it’s great that you and your wife embrace modern latino traditions! BOYS ARE HAVING 15neros now.. hasta crees? ?…pinshi creedos cabrones!!! We deserve quinceanERAS! De tantas cosas we have to deal with, periods , labors, why dont they take that from us?? Claro que no they want the pachanga and 15 mujeres homre typico jajaj jk jk dejame calmar la politica adentro de mi.. but neta i have been to three quinceanEROS..2 in denver and one in New Mexico… its getting big… DO IT TRACY!! p.s. ur son sounds so adorable! I think I got my comments switched around… meant the OMG on the last one on this one, but whatever, you always crack me up regardless, Nikkeya… Gracias! I think it’s in the right spirit for a boy to want a quinceanera. Wish that were the case in our family. Both our girls and our boys all say they’d rather be given a car or scooter. My husband already announced to his daughter that she is getting a quineanera whether she wants one or not. That should be interesting.